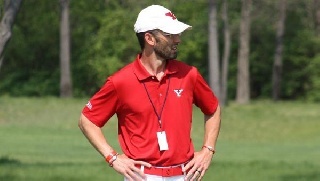 The Youngstown State women's golf team received an NCAA Public Recognition Award which honors teams with an NCAA Division I Academic Progress Rate in the top 10 percent of all squads in their respective sports. The Penguins received the honor for the 2014-15 academic year, a year in which the program won the Horizon League Championship. YSU had a perfect APR of 1,000 for the year as well as a perfect 1,000 for a multiyear APR total. Each year, the NCAA honors selected Division I sports teams by publicly recognizing their latest multiyear NCAA Division I Academic Progress Rate (APR). This announcement is part of the overall Division I academic reform effort and is intended to highlight teams that demonstrate a commitment to academic progress and retention of student-athletes by achieving the top APRs within their respective sports. The APR provides a real-time look at a team's academic success each semester by tracking the academic progress of each student-athlete on scholarship. The APR accounts for eligibility, retention and graduation and provides a measure of each team's academic performance.